Levelére válaszolva tájékoztatjuk, hogy panaszára vonatkozóan az Általános Szerzödési Feltételek Díjszabás mellékletének 2.1-es pontja az alábbi információt tartalmazza. "A GPRS WAP és GPRS Internet havidíj levonása az elöfizetö számlájáról elöre történik, és hóközi lemondás esetén a havidíj fennmaradó része nem kerül jóváírásra. Ismételt aktiválás esetén a teljes havidíj ismételten levonásra kerül. Az adatforgalom a küldött és fogadott adatmennyiség együttes összegét jelenti." A fentiek értelmében, ha Ön lemondja a GPRS Internet szolgáltatást, úgy azt elöfizetéséröl töröljük, függetlenül attól, hogy felhasználta-e a 100 MB adatforgalmat. Ha a szolgáltatás ismételten megrendelésre kerül, úgy annak havi elöfizetési díja levonásra kerül az elöre fizetö elöfizetés egyenlegéböl, és teljes egészéhen felhasználható a havidíjban foglalt 100 MB adatforgalom. Szíves megértését köszönjük!" "A Vodafone felhívja az ügyfelek figyelmét, hogy a ZsebNet opciók esetén a mobil eszközökre letölthető alkalmazásokon (Skype, MSN, Viber, WhatsApp, stb.) keresztül használt, internet alapú hang/video-hívások indítása - és kliens szoftver függvényében a szöveges chat üzenetek küldése - nem engedélyezett. " Lásd a lakossági ÁSZF. idevágó pontjait, 41. oldal, 2.4.1 bekezdés, ahol ők saját maguk teszik ezt nyilvánossá. Persze ez a marketingjükben nem szerepel, ügyesen elhallgatják. Fontos, hogy a magyarországi vállalatok, vállalkozások számára is rendelkezésre álljanak olyan szakemberek, akik adott esetben tudnak vállalni ilyen munkákat és juttatás ellenében bérelhetők. Thanks to GoDaddy Inc., I have been able to set up my official website using their free web hosting. My website can be reached at www.miklos.info. I will continue to provide professional IT consulting services, IT infrastructure support, IT security improvements, support for open-source software using Debian GNU/Linux, FreeBSD and the like. The reasons I don't like the UK / London and I am leaving it. The below are resulting from 3y of actual living experience, both in London and elsewhere in the countryside (Devon 1y, Hertfordshire 4m). People do everything they want. Very low safety and security. Police have little force and people can get away with many minor crimes with little or no justice. Just one example: in 2013 autumn, 6 cyclists were in killed in 9 days in the streets of London in traffic accidents(!). Every official paper you apply for, you need to provide proof of address or proof of ID from the past 3 months (you do not necessarily get such papers from official authorities that often). You need to prove that you are who you are by providing all sorts of paper proofs, making expensive phone calls and visiting customer services on your costs and efforts. The authorities or officials do not help you in validating your past or identification. This shows the poor information technology and the lack of trust. Lot of burden and difficulty of everyday life on the people. Many areas in life people are careless, negligent. Things are done only on the surface, if you want the details they don't care unless you force your way. Instead of giving you the details you need, they give you little information and then just tell you, 'If you have any questions, just ask.' This shows the lack of thorough work, the necessary preparation and demonstrates superficiality. Rubbish is all around (bus stops, streets, open areas), rubbish bins are so dirty that I could vomit when I see them, I do not even go close to them when I try to throw away something (including in front of church entrance, the outside public rubbish bins on Tottenham Court Road), mice in underground, etc. Only touristy areas and rich neighbourhoods are kept clean. Recycling is only on papers and bulletin boards, in real life people could not care less then selecting recyclable waste from regular waste. When you tell them off, they become hostile. When English people see something that is clean and tidy, they call it 'luxury'. You might be saying, 'What???? In this country salaries are high.' Well, on paper, yes. If you compare it with the price of properties and the quality of life (see next point) salaries are actually low!!! If they were earning well, most people would be living on their own flats/houses and not in shared accommodation. A dirty room in an untidy house could cost from £90 per week up to £150 per week. Renting your own place in a decent (not too nice!) neighbourhood starts £1200 pcm for a 1-bedroom flat. You need to be earning at least £60K annually in order to live comfortably in the greater London area. The situation is not easier in the country. Property prices are lower but salaries are likewise. An average family are paying one half of a normal monthly salary for a property rental/mortgage which is not taken care well, dilapidated and run-down. Properties are incomparably expensive. Landlords are unregulated by the Law, they can do everything the market desires. General, everyday life which is affordable is on very low quality. Food, drinks, services etc. that are affordable are low quality for everyday people. If you want to achieve some good quality, you need to pay a very high price in every area of life. Quality and assurance checks are almost non-existing. You need to be very careful to avoid scams, bad quality services, food, drinks, etc., therefore too much burden is on the last chain of trading: the people. Two years ago people could not withdraw cash for 3 days from one of the most popular banks' ATM machines due to a computer software failure throughout the whole country. Last year, many restaurants including fast food sold horse meat as beef countrywide. In summary, the above points are true mainly in London but more or less also elsewhere in the country in general. Note that the above blog is based on my personal experience. I had quite a struggle to make my secure email working in Mozilla Thunderbird the other day. Firstly, I had to sign and install the certificate in the browser as suggested by CaCert's knowledgebase article. Thankfully, I possess 100 assurance points in CaCert Community which means I am certified to sign web and email certificates. So I created a client certificate to my email address and installed it into my Firefox browser. This placed it on the keystore under Tools -> Options -> Advanced -> Certificates -> View Certificates, under the 'Your Certificates' section. The next step would be to insert it into Thunderbird to be able to use it, but that required a PKCS #12 bundled file format (Personal Information Exchange), which includes the key. To obtain that format from my certificate, I had to back up the key from the keystore in FF. This resulted in a .p12 certificate file as shown on the picture. Note the little brown-yellow key on the envelope! That means it's a secure certificate file containing the key. Then, I could import into Thunderbird using the Import menu in the certificate manager. I finally managed to figure it out. Now I am able to digitally sign my email messages using the S/MIME signature. 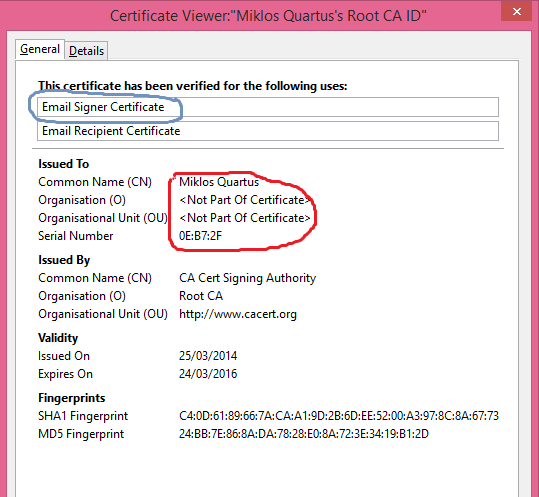 The Certificate Authority was used to issue the certificate is CaCert a.k.a. 'Root CA' in the keystore. This means that the emails I will send digitally signed will make sure my identity is verified and the message's content free from tampering or alteration while it reaches the recipient. The link on superuser.com contains my contribution to the community in relation to the matter. Happy email signing and stay secure! My new website for IT Consulting is up! I have set up my new website to offer IT Consulting services through my own business, Miklos Consulting. Temporarily my website is under construction. Feel free to contact me if you require professional IT services.